Warning! Do not make your order relying only on the tablet name! This information is applicable to China-Tablet PC. 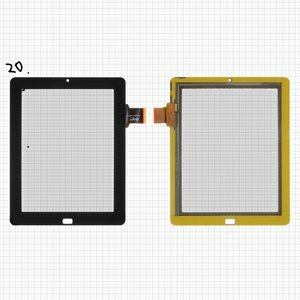 Before ordering a touchscreen, make sure that it is compatible with your tablet. Our article "How to Choose the Touchscreen for a Chinese Tablet or Cell Phone?" will help you to identify the right touchscreen. disassemble your device to check the flat cable marking on your touchscreen and compare it with the product marking on our website . The manufacturer can use different touchscreens with different marking and of different sizes. Note! When substituting the touchscreen avoid its contact with the display or metal frame. Otherwise, it may cause unintentional activation, malfunctioning or axis shifting. When the touchscreen stopped working or you have any difficulties with installation, use tips from our article or Tips Section.